Collison Montross was a seated council member of the Jedi Order at the time of her death. She has instructed many Padawans and Initiates, but only had one official Padawan to train to Knighthood. Before being a notable Jedi Master, she was once revered as a Sith Lord, Darth Entreri, and nearly slaughtered all evidence her own culture, the Mandalorians. As the right hand of Darth Vader, Darth Entreri began to struggle with her feelings and emotions that manifested inside of her, mostly because of the effects of the dark side of the force. After being redeemed by Robert Skywalker, she started her training as a Jedi, and once again became a Padawan slowly working back up to the rank of Knight and then Master after successfully training one Padawan to Knighthood. Later she had apparitions of her fate and took measures to secure her unborn child's future, Thridi Dala Montross, before parting for the netherworld at the hands of Darth MorMacel and robertskywalker- Robert Skywalker. Collison was born and raised on Dxun. Bred from the finest of Mandalorians, she is a direct decedent of the famous Mandlorian Montross and was viewed to become a great warrior that followed her linage. Sadly at the young age of 5 standard years, she was cast out from her clan when they found that she was a force sensitive. 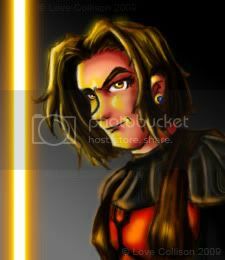 A few years of surviving in the dense and vicious jungles of Dxun, fate had a young Jedi Knight Jevan Faya cross her path and rescued her from the wilderness and brought her to the Jedi Temple to be tested and then trained in the Jedi arts. During her time as a Jedi Initiate, she would spend most of her time in the Jedi archives on Coruscant, absorbing all that she could since she had no official Master appointed to her for several years. 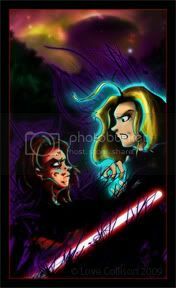 Years later Collison was finally appointed a Master, Jedi Knight Karis Amalia by Tabris Longuine. Collison was very excited since she had never been properly instructed. She only had the knowledge of what the Librarians in the Great Library and Archives would allow her to research. Mostly on lightsaber construction, theories and philosophies on the Jedi Code, History of the Jedi Order and the Galaxy, as well as some transcripts on combat and force powers. She had a great fascination and growing curiosity with the Sith and their teachings, yet there was little to no information regarding techniques or philosophies, at least available for a youngling to access. This all changed after Collison learned of her master's past as a Sith. She would ask Karis to instruct in the ways of the Sith in order to better understand how to deal with them in the field on missions. Karis mentioned that in order to do such a thing, she needed to be granted permission by the Council and ultimately the Grand Master, Robert Skywalker. The young Padawan Collison, begging her Master to seek an audience with the council on the matter, was heart broken when she heard the news from Karis that the council and Robert Skywalker had rejected the idea, and refused Karis to further any information or instruction from her dark past. It was at this point, that Padawan Collison was to be given extra instruction from the Grand Master himself. This was to make sure that the young Padawan didn't abuse her new knowledge of the dark side of the force, which wasn't much. Robert Skywalker also instructed her on his lightsaber form VII, which brought the user dangerously to the dark side. As soon as she was allowed to go off world on her own and wasn't deemed a threat to herself by Robert Skywalker, Collison found herself looking for more knowledge on the Sith. She would travel great lengths to learn of their history and their influences on the Galaxy. Collison, felt as though this wasn't something that should be shunned, but merely another point of view. Collison would continue her studies until eventually, she was sent through the trials. When she passed, brought forth in front of the Council and was granted passage to the rank of Jedi Knight. "Join me Collison, you can be so much more as my apprentice. Think about it, a Mandalorian with Sith teachings! You would be powerful!" "I'll only join you if you give me the power to destroy all Mandalorians." As the Grand Master of the Jedi Order fell to the Dark Side and became known as Darth Vader, he began to look for those to help fuel his cause: The Seven Year War. The Jedi Knight Collison, was then tempted by the dark man himself while she was looking for another crystal on Dantooine. Intrigued by this offer and his complements, Collison agreed, and was thus given the name Darth Entreri. Not only would she become more powerful, but she would have the knowledge she was searching the galaxy for, as well as an opportunity to get her revenge on her former clan, and the rest of the Mandalorian's for shunning her connection to the force. 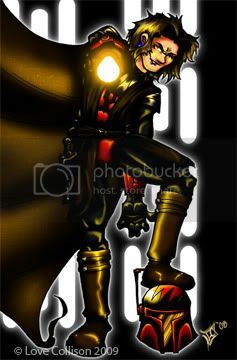 Darth Entreri had nearly fulfilled her desire to exterminate and destroy all records and members that were affiliated with the Mandalorian Culture. She had taken her revenge out on her clan on Dxun, and many other clans, but carelessly missed those that were off world. She continued her hunt, but while doing so that darkside was altering her. Darth Entreri was beginning to regret and question what she had become. There was good in her and there was always conflict inside of her. She wanted to be the Jedi she once was. She had several hallucinations and dreams while she was resting on board Darth Vader's Executor. Master Jevan Faya, came to her as a force ghost several times as she would wash the blood from her face. It was when he appeared that she noticed how much she had aged and had longed for the day she didn't suffer as she did now.In this state of mind, she would have flash backs of her past and mostly saw the image of herself as a child leading her through the memories. Darth Entreri relived her life in third person and remembered how much she enjoyed being a Jedi and what it was to be one. It wasn't before too long that Entreri cracked, and wanted to be helped but didn't know who to turn to. The 7 year war had ended, and Vader had redeemed himself, transforming back to Grand Master Jedi Robert Skywalker. As Darth Vader Reborn, he left Entreri behind oh his Star Destroyer, with an empty promises of training and more power. Recognizing his mistake as a Jedi once more, Robert Skywalker, returned to the Executor with one objective: to turn Entreri back to Collison. He succeeded, and promised to take her under his wing and train her personally. Collison, with the Grand Master's help, came back to the Jedi Order as a Padawan. She quickly rose back to the rank of Jedi Knight and didn't hesitate to take on an apprentice of her own. She was armed with the knowledge of both sides of the force, and was determined to train Leia Skywalker to the best of her abilities. 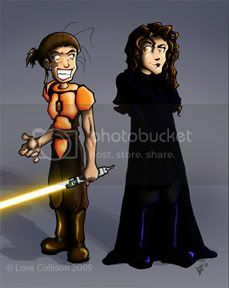 After Jedi Knight Collison's Padawan, Leia, passed her trials and was Knighted, Collison was granted the rank of Master. Her feats as a member of the Jedi Order, eventually gave her enough credit to be worthy of a seat on the Jedi Order's High Council. At the time, she was the youngest Master to ever be appointed to such a position. Collison did extensive search on the creation of Holocrons. She wanted to create one to help aid her unborn child when she was dead and gone, as well as be another form of teaching and knowledge device for the Jedi Order. Despite her efforts and research from the Jedi Temple's Great Library and archives, Collison couldn't find any information on the creation of one. She found her self walking the line of the Sith once more in order to educate herself on the strenuous process which involved using Sith Spells and specific parts created from scratch. She recorded all her findings on a data pad and made sure that the information was also included in her holocron so that future Jedi wouldn't have to risk falling in order to learn of the rituals and technique. All of this information passed through several hands, and was even stolen by Travis Dala, for Darth MorMacel. Before everything was passed over to her daughter Thridi Dala Montross, 8 years after Collison's demise. Originally, Collison held a great standard for her self never to have attachment or a bond in regards to love and relationships. She was one of the few in the Jedi Order who believed that it would lead to the darkside. It was one of the reasons why Master Tabris Longuine pushed for her promotion to become a seated council member. Collison Montross's love life was short and brief, despite her views, with a scoundrel named Travis Dala. He had originally attempted to take her life from a bounty and nearly succeeded by selling the Jedi Master a faulty ship. The ship had crashed, but moment's before, Collison sent out a distress signal that was picked up by her former master Karis Amalia, and was rescued just in time- suffering significant damage. Collison was bound to the Jedi Temple after spending weeks in a Bacta Tank, and resorted to holocron research and youngling lessons to pass the time. Once she healed, she vowed to capture the mercenary and bring him to justice. Travis Dala was caught by Collison, with the aid of Masters Robert Skywalker and Tabris Longuine with his Padawan learner Celia Zatel, months later on Rishi where a secret base of operations for the Exchange existed. It was Collison who arrested Travis only after physically beating him into submission, before bringing him back to Coruscant for his trial which was held by the Jedi Council. Eventually, over time they both eloped on Collison's mission across the galaxy to retrieve her belongings and research on Holocrons. During this time, Collison conceived, but kept it a secret to protect her unborn child from a certain death. Which is why she made a deal on Polis Massa, to keep the child hidden from the man in her visions. Travis never gained knowledge of this, since he was betrayed by the man who hired him: Darth MorMacel. Thus ending their relationship. "I see you have followed into my foot steps more than I would have liked… both with the use of drugs and the darkside. I am truly sorry.. as I am sorry for the hate that rages in your heart." "I only came here for one reason, and it wasn't for your blessing. The galaxy might have forgotten you… but they will not forget me when I am gone. The galaxy will echo what I have done for eons! What you did was a mere dent compared to my wrath." -Jedi Master Collison and Darth Imogen. Collison had many dreams, visions of her death. Jedi call it premonitions, foresight into the future. She prepared herself for the inevitable, never trying to alter the outcome. In her visions she frequently saw the face of a masked Sith later to be identified as Darth MorMacel. In the visions, Collison was apparently slain by this masked menace. She mentioned these dreams to only a few of her counter parts, most notably Master Tabris Longuine. She was finalizing her holocron and began collecting her research that was scattered across the galaxy with her secret lover Travis Dala. During their travels in the vast galaxy, Collison managed to stop on an asteroid called Polis Massa, where a cloning and medical research facility was still being conducted by it inhabitants. It was manned by a Jedi named Jarvis, who ultimately became Darth Alterare, who was conducting research on cloning and taking DNA from high profile Jedi and Sith a like to create the ultimate fighting force. Since Collison had no clue about Jarvis's connections at the time, she had her unborn child removed and left in his care as the clones would be. The child was later to be known as Thridi Dala Montross who after training to become a Jedi, fell to the darkside of the force and becoming Darth Imogen. While on a mission to find and bring the Sith Darth MorMacel to justice for slaughtering and devouring younglings, Padawans, and Knights, Collison was accidentally killed in action while attempting to team up with Grand Master Jedi Robert Skywalker. She had been knocked away several times and urged to stay out of the battle with MorMacel by the Grand Master. She knew he could only be brought down if they worked together. The sith managed to gain the upper hand on Skywalker, while Collison was busy getting up from the force push Skywalker used to keep her back. Collison recognized this and in her third attempt to aid her colleague by jumping in front of MorMacel's saber, to save him. The Sith's saber blade pierced her armor before exiting out of her back. She could have survived, but, it was too late. Robert Skywalker was in mid-air with a powerful kick that was for the sith, but landed on Collison's back. Skywalker's momentum forced MorMacel's blade to sever Collison in half, and taking her lower body away with him as he escaped. Collison didn't fade, as some Jedi Masters do. Before she passed, she was at peace and assured Robert Skywalker that she did not blame him for her inevitable death. Master Skywalker then took remains to Yavin-4 where the Jedi Praxeum was located, and given a proper burial and memorial service. Although Collison was dead and gone, her memory lived on in those that knew her best. She was favored and highly admired by a young Padawan named Celia Zatel. Celia had witnessed the effects the dark side had on Collison and took heed to her wisdom. So much that during Celia's mirror trial, the dark side on the planet that Master Tabris took Celia too, created a the spirit of Darth Entreri. The dark side used the image of the fallen Sith and Jedi to attack Celia as well as give incite to Celia's future. Even though the teenage Padawan refused to fight the image of her fallen friend, the dark side that manifested around Celia only to be relinquished by her alignment with the light side of the force. "The darkside and those death sticks are clouding your judgment… as well as your logic to comprehend what I am saying to you. You cannot like what it is turning you into… nor does your counter part… your former master… and a dear friend of mine, Celia. You both are walking a path I cannot follow… "
Collison had managed to study the force enough to communicate while in the netherworld, and followed her daughter, Thridi, as she was training to be a Jedi. Aiding her within the force, but never in a physical form until Thridi had fallen to the dark side of the force. Collison had hoped that her daughter would follow in her foots steps and become a Jedi like herself, but there was a catch. She finally reveled herself as a force ghost to Thridi, who was now a self proclaimed Sith Lord named Imogen, what Collison had feared the most. She made one last attempt to redeem her daughter, until Imogen decided to get what she came for: her mother's battle armor. Since then there haven't been any reports of others making contact with Collison… but there might be another in the Jedi Order who is secretly communicating with her for more knowledge and council in regards to the netherworld. "I have you failed…. I have failed…"
Collison was known for her quick wit and humor. Despite her being a respected Jedi Master, she still liked to have fun. She has been known to pull small pranks on her colleges. Most notably with the youngling Celia Zatel, and helping her with idea's on getting the old man, Tabris Longuine to loosen up a little. When she wasn't looking for a good laugh, she more than likely was found in the Council's Chambers researching various subjects but mostly on Holocrons, if there weren't any pending issues or missions that needed assistance in investigating. While on her spare time, she could be found in her favorite pub on Coruscant, McDougles, where she would frequent regularly and indulge in the nightlife with strong drinks. She has been known to even smoke a few death sticks from time to time, just to have a good rest from the force, but this was very rare. She wasn't the dating type, despite many advances from many people. Collison found it to be an unnecessary burden that Jedi had no business indulging in, for fear of the consequences that relationships ultimately bring when they fail. Although, despite this she went against her own beliefs and teachings before her death, where she started to change the way she saw life because of her apparitions in her dreams. Since Collison has used both the light side and the dark side of the force, her powers are very versatile in regards to the force. She proficient in using three different lightsaber forms: II, III, and VII. Although, she has practiced form IV when she wielded two sabers at a time, but this form was far from perfected. She was also a good hand to hand combatant and enjoyed a good sparing match without lightsabers or other conventional weapons, mostly because of her rearing in the Mandalorian culture as well as her survival in the jungles on Dxun. She was decent marksmen without the aid force, with it, she could hit a man between the eyes in the heat of battle if she so wished. Aside from these combat and force traits, Collison was also a cunning pilot, mechanic, and had considerable knowledge with technology. A true 'jack of all trades' so to speak. She was also known to carry one modified blaster pistol and was an excellent shot, even without the aid of the force. Collison only used the blaster when she was working undercover and didn't want to give away her affiliation to the Jedi Order with the presence of her lightsaber hilts. Aside from her weapons and force abilities, Collison was a talented pilot and was more than likely a thrill seeker since she always pushed the limits of the machines she piloted. Often times she would purposefully speed in high traffic or in tight places to scare passengers on board her ship, even though she was in complete control. She usually flew Jedi Star Fighter's when on lone missions, although she had bought her own smuggling ship from Travis Dala, before crashing it. At the time of her death, she also owned a newer model of the KR-TB from the Corellian Engineering Corporation.